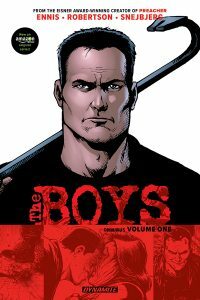 Dynamite Entertainment is releasing Garth Ennis and Darick Robertson’s Eisner-nominated series, The Boys, in a brand new format for fans and readers looking to jump on board with the critically-acclaimed series before the television adaptation debuts with Amazon Prime Video in 2019. At a massive 344 pages, the fan-favorite series draped in controversy is now presented in an omnibus edition as Dynamite releases the first 14 issues of the acclaimed series in one oversized trade collection! Join the most brutal government operatives ever assembled in tales of mayhem and dark humor, as chronicled by Garth Ennis, Dennis Robertson, and Peter Snejbjerg. Meticulously restored, The Boys Omnibus Edition Volume 1 also features bonus art materials, the script to issue #1 by Garth Ennis, a complete cover gallery with iconic artwork by Darick Robertson, and much more.